Prison Greyhounds, Up & Running! After three years in the making, Prison Greyhounds has finally gotten the program rolling with their first batch of dogs. The three Greyhounds (Dillinger, Gordy, and Rosey) came from Daytona and have been placed in their program at Putnamville Correctional Facility in Greencastle, Indiana. These retired race dogs will be fostered, trained, and socialized by six inmate-handlers, with the support of prison team volunteers (including a veterinarian). Many former racing greyhounds spend their retirement on hold in cages because adoption groups cannot find enough foster homes. Some nonviolent inmates are ready to make amends. Working together, Prison Greyhounds hopes to impact both prisoners and greyhounds. Prison Greyhounds rehabilitates the retired greyhounds prior to their adoption into permanent loving homes. The program also aids in the rehabilitation of the inmate-handlers who gain job skills, teamwork experience, and the opportunity to explore a better way of living before their release into our community. Headquartered in Indianapolis, Prison Greyhounds is an all-volunteer 501(c)(3) nonprofit organization. 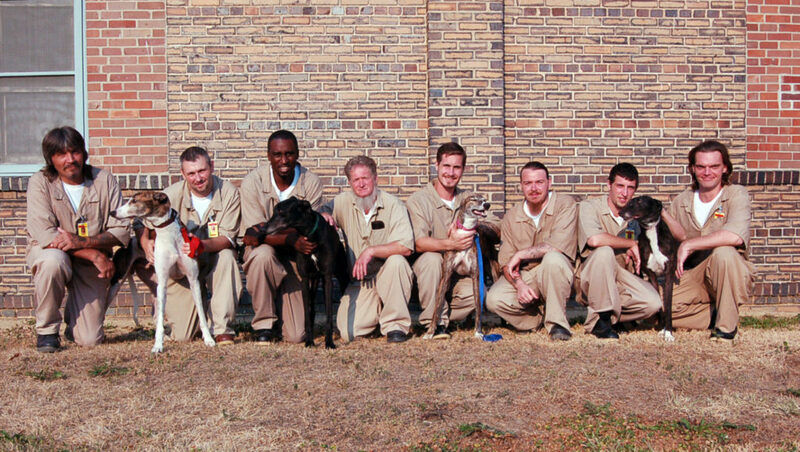 They rescue greyhounds who are in the prime of their life and match them with specially selected inmates within Putnamville Correctional Facility in Greencastle, Indiana. A team of two inmate-handlers per dog will train the dogs for life outside of a racing kennel, thus ensuring a more successful adoption. The dogs provide a calming effect on the entire prison population. Prison Greyhounds provides the curriculum, volunteers to coach the inmates, and all necessary supplies, including dog food, bedding, and leashes. They pay all veterinary expenses, including spay/neuter treatment, full dental, all vaccinations, and heartworm prevention They also find the responsible families to adopt the greyhounds upon their “graduation” from the program. Visit their website at www.prisongreyhounds.org to learn more about the program and volunteer opportunities or to meet the dogs at an adoption event. Sleeping Giant Creative believes that every person, every entity, and every endeavor holds a great deal of hidden potential. Sometimes all it takes is a creative kiss of life to awaken what’s been sleeping inside all along. This website and its content are copyright of Sleeping Giant Creative | © Sleeping Giant Creative 2019. All rights reserved.